there’s an unmistakable sense of urgency that runs through every frame of Captain Phillips. A harrowing account of the 2009 storming of an American cargo ship by Somali pirates, this live wire, time bomb of a film grabs you by the throat and doesn’t let go till the end.Greengrass, who brought an unlikely cocktail of kinetic action and real feeling to the second and third films in the Bourne trilogy, strips this story bare in a way that he’s able to say something important about the unfair world we live in. He gives Captain Phillips the depth required to be more than just a story of heroism and bravery. I’m going with four out of five. It’s brutal, edge-of-the-seat filmmaking that you cannot afford to miss. Captain Phillips is a harrowing experience. The film is based on the true story of Captain Richard Philips, the captain of a cargo ship, which was hijacked by Somali pirates. Captain Phillips isn’t easy entertainment but it is a film that will force you to think. It’s also a visceral experience that shouldn’t be missed. I’m going with four stars. Shot in tight spaces and suffocating close-ups, Captain Phillips attempts to be a thriller more than a docudrama. The other reason that prevents the film from entering the thriller category is that it seems to be more about a clash of two ways of life, in Muse and Phillips, than about the rescue operation itself.Nevertheless, Captain Phillips makes for an interesting watch – if you can survive the constant hammering of the background score. Just fast enough to keep you gripped, Captain Phillips is good entertainment that, thankfully, has its brain intact. Captain Phillips is based on a true story. 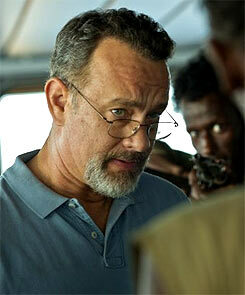 Tom Hanks plays the title role of the captain whose cargo ship is hijacked by Somalian pirates. Captain Phillips is going through an email about sea piracy and his ship stands hijacked. All this happens in the first fifteen minutes and in no time, you are a part of the hostage drama. As the story unfolds, you are going to be on the edge of your seat right till the last scene. Based on the real-life account of a Somali pirate attack in 2009, Captain Phillips begins in a routine way and concludes in a Best Actor Oscar bid, but the opening and climax bookend an often heart-stopping battle of wills between a ship cargo crew and four daredevil pirates. Although there are moments of release across the near relentless 134-minute cat- and-mice game, Captain Phillips actually works best when Greengrass keeps his finger on the trigger. Hanks’ everyman-in-a-crisis turn is effective and on expected lines but is eclipsed by Abdi’s tragedy, which stands in for an entire nation gutted by colonialism, poverty and civil war.